Elizabeth Rider, MSW, MD, a pediatrician and medical educator, teaches and consults internationally on relationship-centered care, communication skills, professionalism, reflective practice, narrative, and healthcare education program development. 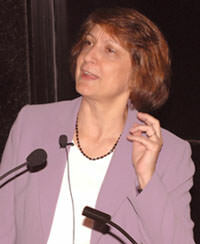 An Assistant Professor of Pediatrics at Harvard Medical School, Dr. Rider has been an invited speaker in the US, Canada, United Kingdom, Hong Kong, Australia, and Taiwan, where she was invited by Taiwan’s Education Ministry to teach leaders from Taiwan’s 11 medical school about teaching, assessing, and integrating communication and relational skills into medical education curricula. As Director of Academic Programs at the Institute for Professionalism and Ethical Practice, Boston Children’s Hospital/ Harvard Medical School, Dr. Rider creates and directs courses to enhance relational and communication skills and compassion for healthcare leaders, faculty, trainees, and clinicians. She also founded and directs Boston Children’s Hospital/Harvard Medical School’s first Faculty Education Fellowship in Medical Humanism and Professionalism. Dr. Rider has received many teaching awards including the Morgan–Zinsser Fellow in Medical Education Award, Harvard Medical School, the Medical Educator Award for Innovative Scholarship in Medical Education, The Academy at Boston Children’s Hospital, and others. Dr. Rider is Carlton Horbelt Senior Fellow, and Co-Chair of the Medicine Academy of the National Academies of Practice (USA). She serves on the boards of various non-profit organizations including the Stoeckle Center for Primary Care Innovation, Massachusetts General Hospital, I*CARE (Interpersonal Communication And Relationship Enhancement program), M.D. Anderson Cancer Center, and others. Dr. Rider also served on the Board of Directors of the American Academy on Communication in Healthcare for many years, and on the National Board of Medical Examiners’ Communication Skills Task Force. She is Associate Editor for the journal Patient Education and Counseling, and lead author of the book, A Practical Guide to Teaching and Assessing the ACGME Core Competencies (2007 & 2010). A graduate of Harvard Medical School, Dr. Rider completed her pediatric residency at Boston Children’s Hospital, and fellowship in general academic pediatrics at Massachusetts General Hospital, both Harvard training programs. A former child and family therapist with a master’s degree from Smith College, she is board certified in both pediatrics and clinical social work (LICSW, BCD). Dr. Rider is a founding member and chair of the external advisory committee of the International Research Centre for Communication in Healthcare established at Hong Kong Polytechnic University and University of Technology Sydney, Australia, and also leads its International Charter for Human Values in Healthcare initiative, a collaborative effort involving people, organizations and institutions working together to restore core human values, including compassion, to healthcare around the world.